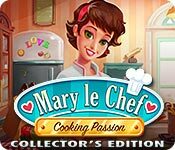 Mary le Chef: Cooking Passion Collector's Edition is rated 4.0 out of 5 by 34. Rated 5 out of 5 by anokinono from A Game of Impeccable Taste, Style, and Fun! First Impression: This is my first time playing any game resembling the Delicious Series game-play. I wasn't sure what I was getting into at the start of this game, but quickly realized that I've found a new favorite kind of Time Management game! It's easy yet challenging, fast-paced, addictive, and beautifully rendered. Story: We follow Mary as she struggles to balance the expectations of her family of lawyers and her passion as a chef. With all the ups and downs of a well-written drama, Mary le Chef: Cooking Passion kept me coming back for more of its intriguing story. Even as I operated under the assumption that it would follow a generic and cliche story of a young woman in love, it surprised me with twists and turns in that plot that had me clicking on level after level to see what happens next. Game-Play: The overall mechanics of this game are easy to learn and master. Even though it has the possibility of getting repetitive, each level comes equipped with a different Diamond Challenge that has to be completed in order to unlock some bonus content. And these challenges come in a wide variety, from serving in perfect order, to setting up decorations, it's just enough variation to keep the game from becoming tedious. Aesthetics: I loved the graphics and sound effects of this game. Everything has such a high quality to it, it is so easy to get absorbed into it. I especially enjoyed the warmer color tones of the gorgeous scenery, it was easy on the eyes as I tend to play at night with limited artificial light. And the main song? 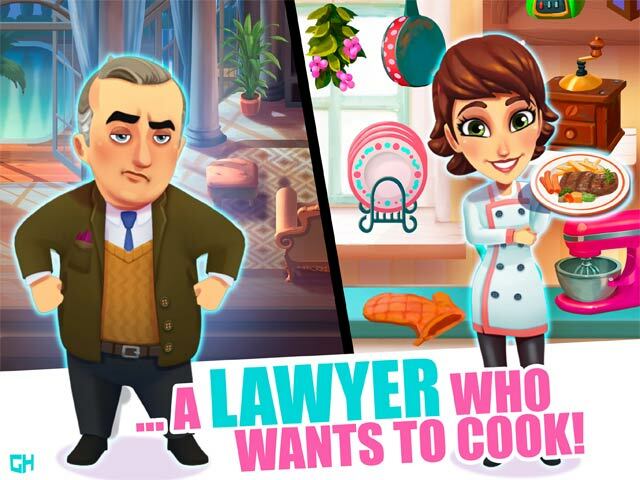 I may or may not have found it on Spotify and downloaded it... Cons: There are aspects of the gameplay, such as a massage table, that don't make sense with the overall plot of Mary being a chef. And there isn't enough explaining in the world to make it all connect, but it's easy enough to accept. Another con is that, there are times when a group of customers will enter into the restaurant and leave upset for no apparent reason. It seems that, from what I gathered, if the party enters the restaurant and the specific table they want is occupied (even if there are five tables and only one is occupied) they will leave angry that the table isn't available. Which is a tad frustrating. It doesn't negatively impact your score if people leave your restaurant, not unless half the restaurant leaves and you run out of time, but it is confusing. Overall, this game is a blast and a half and I would happily recommend it to fans of the Delicious Series (I feel it does the entire series proud and has converted me into a fan, determined to see the games that started it all) and those who have never even heard of Delicious. Rated 5 out of 5 by AJLlewellyn from Tough but fun! I love this game. I have been waiting for a new Emily game then along came Mary...and she is spanking my pants. Some of the challenges are so difficult they make me feel stupid but after playing some of the challenges over and over a few times I conquer them and feel super smart. Yay me! This is a great game. Hope we see more of this snazzy little chef! Rated 5 out of 5 by keegan12 from Lots of Fun This is a fun game that reminds you of the Emily series including finding the mouse and a visit by Emily herself at the end. The story is about a young girl expecting to be a lawyer but follows her heart's passion of being a chef instead. It was not extremely challenging but enough to keep me interested from start to finish. I highly recommend it and had no glitches playing it. Yeah! Rated 5 out of 5 by jnow1101 from Mary Le Chef : A Culinary Delight! What a fun game! I love, love, love Delicious and this was obviously a spin off! Just a great, fun game with a sweet and humorous storyline and dialogue! Can't wait to see more Mary games! Rated 5 out of 5 by LadyoftheIvy from Another great Delicious spin-off! This is another great game from the creators of the Delicious series of games with Emily. If you've played those, you have a pretty good idea of how this game works, and will likely enjoy this one quite a bit. (If you haven't, give them a try! They're wonderful!) This one is directly connected to Emily, as you see her in this game. It's not a part of her storyline, however, as Mary has her own story to tell in this game. The graphics are quite nice, much like the more recent Delicious games. Some of the movement seems a bit weird to me, but I think that's just because the people sort of bob as they're moving in a way that I don't remember them doing in any of the Delicious (or related) games. It's not a huge deal, though, it's just one of a few oddities with this one compared to the others. The music is pretty good (the theme song during the level selection map is catchy), though it does occasionally change without any transition in an odd way during the cut scenes. And, much like the Emily games, there are a fair amount of cut scenes, because this one appears to have just as full of a story as those games. 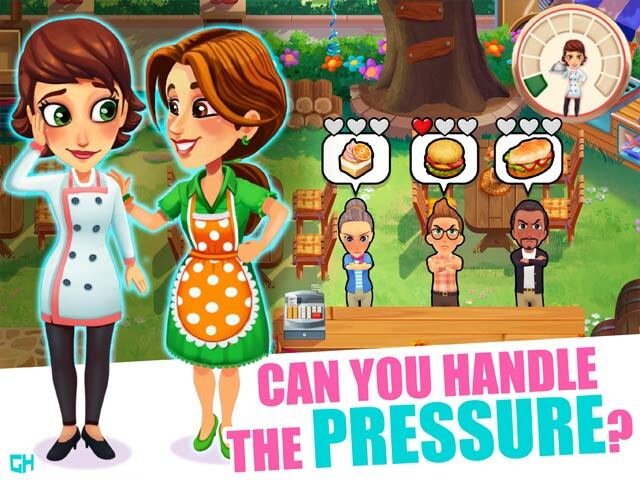 Game play is pretty similar to the Delicious series - prepare people's food orders, deliver it to them (whether at the counter or table), collect money, and clean up. Much like the other games, there are additional challenges to many of the levels (set up for the party, for example), as well as the mouse to catch. You can upgrade things in your restaurant via the money you earn during levels, and eventually upgrade the menu items as you earn those upgrades. The diamonds you earn from completing challenges can be used to buy gifts in a scene, and there are additional achievements as well (finish the chapters, walk a certain distance, etc.). This game also provides actual recipes as you complete chapters, which is rather neat. The primary differences I noticed with game play are that items you click on to pick up don't appear in your tray until they're actually picked up (unlike the Emily and related games, where a faint image would appear before you actually picked it up), the pause/menu button is at the bottom of the screen with the tray and score bar (only a problem if you've played a lot of the previous games and keep trying to find it in the upper left like I do), and there is sometimes very little guidance on how you accomplish a challenge. (Note: I played on Normal mode.) Most of the time, that isn't actually a problem, but it took me a little bit of frantically scanning the screen to figure out how to keep my disguise on for that challenge, for example. For the most part, this is a lot like the Delicious and related games, as I mentioned. It's pretty well done, much like the related games, and a lot of fun. I would definitely highly recommend this game in addition to all the previous ones! Rated 5 out of 5 by Karavan from Just totally fun Thank goodness for a new TM game that is set at a pace that makes it fun to play. The levels are achievable without frustration and the story line is interesting. I play to have a good time and this delivers that. If you like the Delicious Emily series you will like this game too.